Panelists: Dan Simon (Publisher, Seven Stories Press), Sarah McNally (owner, McNally Robinson Bookstore), Hannah Tinti (editor, One Story), Michael Orthofer (Complete Review), and Tim Brown (freelance reviewer). 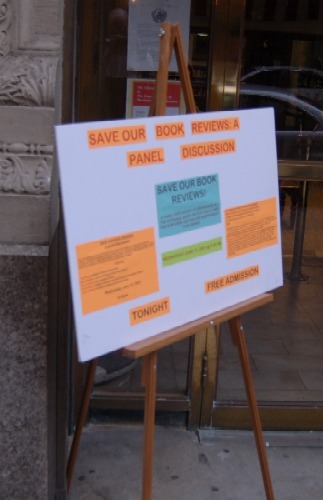 On Wednesday night, a crowd of thirty — mostly over the age of 40 — gathered at the New York Center for Independent Publishing for yet another round in what John Freeman described as “part of an ongoing…uh…educated campaign to save book reviews.” I’m not sure what Freeman meant by this. Is the campaign itself educated? Perhaps it’s one of those partisan presentations uninterested in considering opposing views. Or perhaps the idea was to assemble a group of people who all very much believed in the same thing. Freeman, dressed in a blue shirt with the top buttons open, resembled a cross between a thirtysomething John Travolta ordering two slices of pizza and a schoolboy who hoped to impress. His neck was, at least from my vantage point on the right, almost nonexistent. He moderated the panel with a mumbling lack of confidence and, when he spotted me, immediately began tossing around references to reviewers I knew, calling his favorite reviewer “Adam Kirsh,” a clumsy attempt to be a wiseacre, seeing as how other bloggers were in the crowd. He visibly panicked when I managed to procure the microphone to ask a question and did his best to keep the conversation going to avoid the apparent muckraker holding the mike. The panel’s ostensible purpose was to explore the connections between independent presses and book review coverage. Freeman began by mentioning how he had observed a crowd of people around a giant TV screen on 6th Avenue, bemoaning how the image has devoured the printed word. “We’re here in a bunker,” said Freeman. I looked around and saw only an inviting library, with a malfunctioning globe light flickering on and off as the tepid conversation continued. Were there MREs hidden behind all the books? Freeman then noted, “The New York Times Book Review is healthier than ever,” and began a considerable series of references to an “eco-system” in which book reviews were a vital part. Unfortunately for Freeman, Sarah McNally outlined the hard business of what it is to sell books. She would later point out that readers respond to blurbs and that “placement is more important than reviews.” She noted that she would not order books in catalogs if they did not contain review quotes. Elaborating from the onset on whether book reviews caused people to purchase books, McNally noted that “it depended on the generation.” She expressed her dismay that there weren’t enough local or regional conversations, and then noted that “that Australian guy from Grove Atlantic, Tim Flannery” had made a difference because of these “literary conversations.” McNally doesn’t seem to know her stock. Actually, it was Richard Flanagan and his most recently released book, The Unknown Terrorist, that McNally was referring to. With a smiling Michael Orthofer mostly laconic throughout the panel, I’d have to say that Tim Brown struck me as the most interesting and thoughtful guy there, and the only one of the bunch who kept the conversation pertaining to small presses throughout. Perhaps he should have been the guy to moderate. When Brown wasn’t looking up into some unidentifiable area of the stacks to his left, he would express his concern about books that were never covered. He cited Rain Taxi as a must-read literary journal that did a good job of covering independent titles and that everybody in the crowd should subscribe. Hannah Tinti offered a brief summation of One Story, which arose to fill the gap left by the now defunct Story Magazine. She viewed the literary magazine as a stepping stone for literary writers. “We exploded as much as you can explode in the literary magazine world,” said Tinti, with no particular hint of a Bleak House-style spontaneous combustion in her answer. Orthofer, the most relaxed of the panelists, pointed to the origins of the Complete Review, noting that it had begun as a way to explore “the possibilities of the Internet.” At the time he began, there were very few places that would link to other reviews, but spoke highly of newspaper reviews, noting that, “Weblogs will just write about their reading habits.” He bemoaned the attention given to Tina Brown’s book. Simon said that he loved the words “independent” and “corporate” to identify the two communities. He styled the NBCC members as “partly picaresque, true believer characters,” but didn’t cite any specific examples. Indeed, as the conversation went on and the crowd and panelists unfurled sentiments about the NYTBR, it became quickly apparent that book reviews may not have lived up to Simon’s definition. Tinti observed that it was the independent bookstore that often talked to a local newspaper to get an author event looked at. Brown elaborated, observing that, “By and large, journalists are very lazy people,” bemoaning that some of the reviews he read resembled press releases. “It sounds like we should have a party here between small press and critics!” interjected Freeman, presumably hoping to prove Brown wrong about those fun-loving journalists. Alas, Freeman’s awkward remark was rejoined by crickets before the crowd loosened polite laughter. As Simon and McNally continued to chat to themselves, Freeman snapped them a stern look and they quickly shut up. “You can’t read 200 news sources a day,” said Freeman. “Unless you spend all day on the Internet.” Obviously, Freeman has never heard of RSS feeds. Orthofer continued, pointing out that there was a marked difference between generations. “Newspapers are just a different kind of medium,” he said. Simon then quibbled that in the age of the Internet, there was no arbiter role. Meanwhile, Brown suggested that book reviewers could be more pro-active. “Pro-activity. I cannot emphasize this enough. Maybe there should be more of me out there.” Brown noted that he was only paid in contributor’s copies. Responding to Freeman’s boasting of the NBCC Awards, McNally observed that awards made little difference in selling books, with the exception of the Booker. She had no clue as to why the SoHo book crowd was so interested in the Booker. Freeman revealed again that he could not write about certain books, pointing out that he had attempted to write in the first-person for a review of Dennis Bock’s The Ash Garden that he penned on September 11th, only to see the paragraph elided. A woman in the crowd observed that she had given up on the New York Times Book Review and asked the panel if there were any book reviewers writing with pizazz. Freeman pointed out that he had written for the NYTBR, although a search through the Books section from 1981 onward reveals nothing authored by Freeman. Simon observed that book review sections did champion small presses, pointing out that if you considered that small presses occupy 3% of the marketplace, books got a better percentage in book review coverage. Brown compared the 400-600 word review to a villanelle and pointed out that he had learned everything he knew about book reviewing in the third grade. Despite Brown’s clear enthusiasm, I felt, given the staid air in the room, that the panel needed to be shaken up. So I beamed a broad smile to the kind woman with the mike and, when Freeman tried to keep the conversation going as long as possible, deferring my question until the last possible moment, I asked Freeman why book reviews should be saved if they faced the kind of dryness and inability to write in first-person that he had personally described. I asked him why there had been little introspection. I asked him why book review sections didn’t grab their readership by the lapels as frequently as they could and why we all weren’t looking to the book review section, not as electric as it could be, as the culprit. “You can’t make a generalization like that,” responded Freeman. Simon bailed Freeman out, noting that he had agreed in part with my “provocation.” He once again pointed out that things were good for small presses on the book review front, proportion-wise. Tinti offered similar remarks. Before the panel was over, Freeman got in a dig at a “3,300 page book” he reviewed that “drove me insane.” That’s funny. When Freeman covered the book for the Boston Globe, he didn’t seem to feel that way. I wonder if John Freeman believes you moved to NYC to personally make sure he is doing his job. Also, what’s the deal with the science fair poster? Surely someone with some graphic design sense could have made something up. What purpose do the Freeman jabs serve? Is the hyperbole intentional? (It seems clear to me that there is hyperbole here.) If so, what is its function? I have to admit, this post reads as petulant to me…am I missing something? Having been at the panel, I’m not sure Freeman’s mention of Adam Kirsch was “a clumsy attempt to be a wiseacre.” However, I wouldn’t have known Kirsch’s name if it weren’t for his recent jab at blogs. It was interesting, I thought, how Freeman talked about reaching a broad audience while everyone else brought up niches. Critics obviously want to be widely read, but anyone who’s ever sold a book knows to look for its niche. Why would Freedman say he’d written for the Book Review when as you point out, he doesn’t appear in the archive? Is “comprehensive” the nice way of saying “boring”? Thanks! It was great to meet you at last. Not all the NYTBR book reviews are in the archive. For example the August 1983 review of my story collection (and David Evanier’s) by Ivan Gold isn’t there, nor are reviews by Ivan Gold of Tom McHale’s last book and others. I’m not sure why this is. The Tasini v. New York Times decision led to the disappearance of many freelance articles from databases; my August 1997 op-ed article is nowhere to be found (and folllowing the Tasini decision, other newspapers similarly took off my op-ed pieces from their databases as well as from Lexis/Nexis). Sorry, but it would interfere with the persona I’ve so carefully created. This is just the sort of tendentious writing–laced with personal attacks and bristling with unearned hauteur–that makes some people shudder at the idea that we’re moving toward a world where we have to rely on blogs for information, criticism, etc. What, precisely, is your point? Are you upset because Freeman, et al dismissed your long-winded, 11th-hour comment? And what’s with dismissing the good work and knowledge of the brilliant and eloquent Ms. McNally for momentarily misplacing the name of Richard Flanagan? Trust, she is as familiar with her stock–and with contemporary literature–as anyone you know. Further, if I were to walk into an event looking like the ungodly spawn of Lex Luther and Little Baby Huey, I would probably not lead my entry with ad hominem attacks on the appearance of the moderator. From my perspective, this entire charade of a discussion reeks of hypocrisy– hypocrisy coming from all sides. In truth, there’s little difference between John Freeman and Ed Champion. Both pose as concerned literary democrats and both are writers whose chief concern is career and self. They really, REALLY, don’t want to change a thing about literature today. What they want is to use whatever necessary pose is available to gain a position of power within the present system. Then, they are certain to be as exclusionary and closed-minded as their elders. Doubt it? Both are terrified of ideas which come from OUTSIDE the acceptable literary world. Both already exclude, or want to exclude, the ULA– a voice from a different segment of society from that represented by the panel– from today’s literary debate. Oh yeah– change is great among your crowd, as long as nothing is changed. What! The same educated brats posing at trust-fund hangouts like Housing Works? Last time I was there it was filled with the gentry, Ivy League variety. The present dispute between print reviewers and lit-bloggers as evidenced here is as much of a difference as intramural volleyball games at Yale. (Fittingly, Opportunistic Ed exists in both camps.) It represents as much of a real discussion as the meaningless debates between Dems and Repubs on Capitol Hill, while outside the sham show across the country the general public becomes increasingly alienated. Ralph Nader/King Wenclas for 2008! I’m glad that people are staring to call Ed on the mediocrity of his content based on personal vendettas. Strange that so much of what poses as literary criticism isn’t about books at all. The swipe at Ms. McNally, in addition to being somewhat gratuitous, may no’t even be correct, since she most likely DID mean to refer to Tim Flannery and the way that his non-fiction book from Grove Atlantic, The Weather Makers, helped transform the public debate about climate change in 2006, a belief expressed by Morgan Entrekin himself earlier this month. “he ungodly spawn of Lex Luther and Little Baby Huey” This is really mean, though I have to admit, it made me laugh. What the Ed critics don’t seem to realize about Ed is that in Ed’s world, art exists only in relation to Ed, not the world at large. He’s on record saying that he takes art, “personally” that something he thinks is bad “offends him.” He also can’t stomach rewatching Zodiac because of the memory of immature hijinks by kids in the theater during original viewing. Ed’s critiicism and reportage is completely myopic, not an effort to engage in a conversation, but an effort at self-contained, self-expression. It’s what is both fascinating and frustrating about Ed. Ed is uninterested in audience. He’s like a form of pure personal expression. This is why his reviews often seem disconnected from the idea that someone other than Ed would need to engage with it. It’s also why his podcasts are frequently interesting, because he doesn’t seem to give any thought to questions other than what’s in his own head. My bet is he’d be off the charts on a narcissistic personality evaluation. I’m not sure I’d want Ed as a friend, but this combo makes him a fascinating blogger. Ron Hogan’s note is a perfect example of Ed’s operating universe. Ed assumed he was right about who McNally was referring to with perfect conviction, didn’t even question the possibility that this other person might be right. That’s our Ed, and we love him for it. “Save Our Book Reviews!”is a good topic The information which is in your site it is very use full to all the book lovers . I have gone through your site and I got much more information from your site.Recently i have visited one book review site which is smiler to yours that may be use full to you and your visitors .